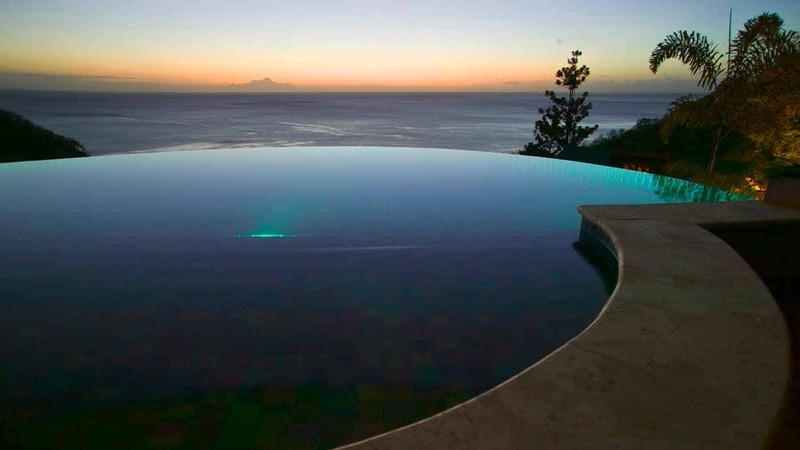 Water Quality for your pool | CleanPools - Your SA experts for clean pools. Water quality is maintained in your swimming pool through a combination of water circulation, filtration and chemical balance. Your pool pump circulates the water from your pool, through the filter and then the water is returned back to the pool. The water circulation process also assists any chemicals that are added to be evenly distributed throughout the pool. The pool filter removes particles and other contaminants from the water, helping to make your pool look clean and clear. During summer months your filter should run for between 8-10 hours per day and half this time during winter. Filtering time required will also vary dependent upon the amount swim activity that your pool may have. Water that is chemically balanced provides a safe and healthy swimming environment. Chemicals are added into swimming pool water so that the water is safe and isn’t a health threat. If chemical levels are too low, it can lead to severe corrosion problems on pool surfaces and equipment. Conversely if chemical levels are too high, the formation of scale can appear on your pool surfaces and equipment. Chorine is used to help disinfect and sanitise your pool water by inactivating any microbes that may be present. Chlorine is also an effective algaecide. Free chlorine is the amount of chlorine available to do the work of disinfecting and sanitising. If free chlorine falls below one part per million, it is unsafe to swim in. Combined chlorine is the amount of chlorine that has reacted with organic matter and is now no longer effective. Sunlight and heat both play active parts in determining the amount of chlorine needed. 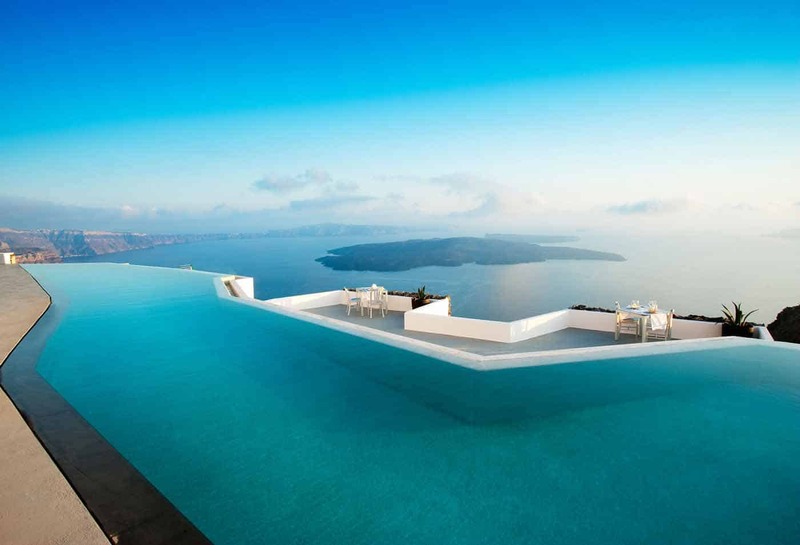 On a sunny day chlorine can lose 90% of its effectiveness within two hours. By using a stabiliser (absorbs the sun’s UV rays) the loss of effectiveness can be reduced to approximately 20% in the same time period. Stabiliser not only extends the life of chlorine, but also and reduces chlorine consumption. pH is an abbreviation for “potential Hydrogen” and is the measure that determines the acidity of the water at any moment in time. The PH scale is from 0 to 14, with 7 being neutral. Anything below 7 is acidic and anything above is alkaline. The Australian Standard for private swimming pool water (AS 3633), specifies the operating range as 7.0 to 7.8 (with 7.4 being ideal). SPASA recommends 7.0 to 7.2 for fibreglass pools. Hydrochloric acid or pH decreaser is used to lower pH in your pool and soda ash or pH increaser is used to raise the pH. The pH of our eyes is typically between 7.0 to 7.3, so acidic water (below 7.0) will sting a swimmer’s eyes and have them turn red. Acid also removes natural oils from our body, so your skin will become itchy and dry. For your pool (over time), acidic water will corrode metal surfaces, screws, etc, inside your pool, pump, filter and heater. Acidic water will also etch plaster, grout, stone, concrete and tiling. Plastic on cleaners, toys or other equipment will become brittle and prone to breaking. Also if the pH drops much below 7.0, the amount of available chlorine is greatly reduced which creates an environment that promotes bacteria and algae growth. If the pH is too high (above 7.8), the chlorine in your pool will no longer work and be effective in killing harmful bacteria. A high pH will increase chlorine consumption, cloudiness of your pool water and cause scaling along the sides of your pool. Total alkalinity is the sum of all alkaline substances in your water. In swimming pool water the total alkalinity (TA) should be between 80 to 120 parts per million. Total alkalinity within the ideal range stabilises the pH level of your pool and will prevent rapid pH changes. High total alkalinity (200 parts per million or more) is too high and can make your pool water cloudy and cause scaling on the sides of your pool, equipment and plumbing. 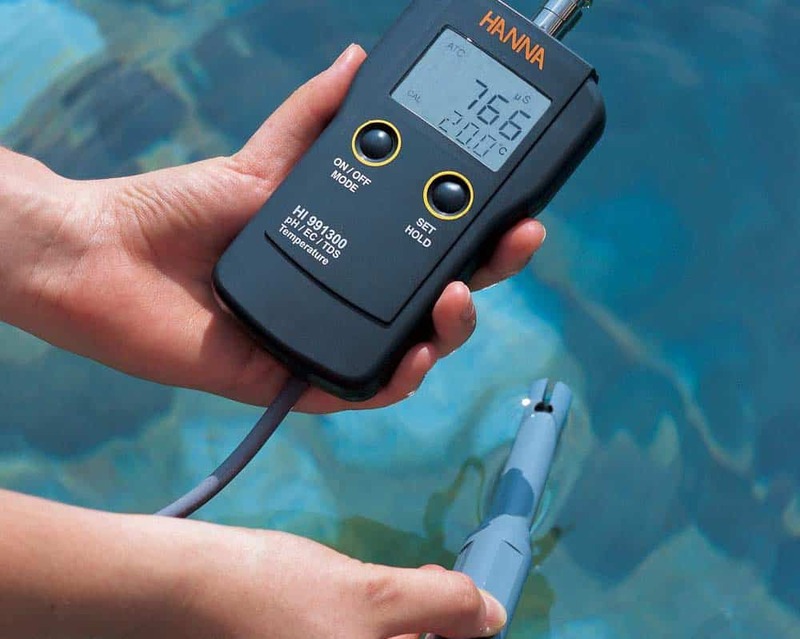 High TA also causes the pH level of your pool to drift upward, potentially creating a situation which it is very difficult to adjust the pH level up or down. Low total alkalinity (below 80 parts per million) will make it difficult to increase the pH level of the water and will make the water acidic. Acidic water corrode pool surfaces and equipment. 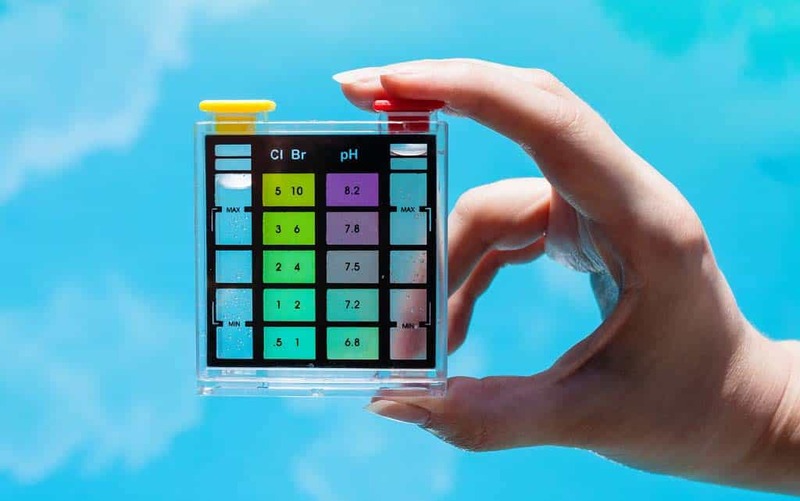 The total alkalinity and pH are interconnected, raising the TA could also raise the pH of your pool. It is recommended to use buffer (sodium bicarbonate)when raising total alkalinity, as it will minimise increases in pH. When adjusting total alkalinity, it’s best to raise the TA artificially high, so that when acid is added to lower the pH level, the TA will reduce to be in the correct range. 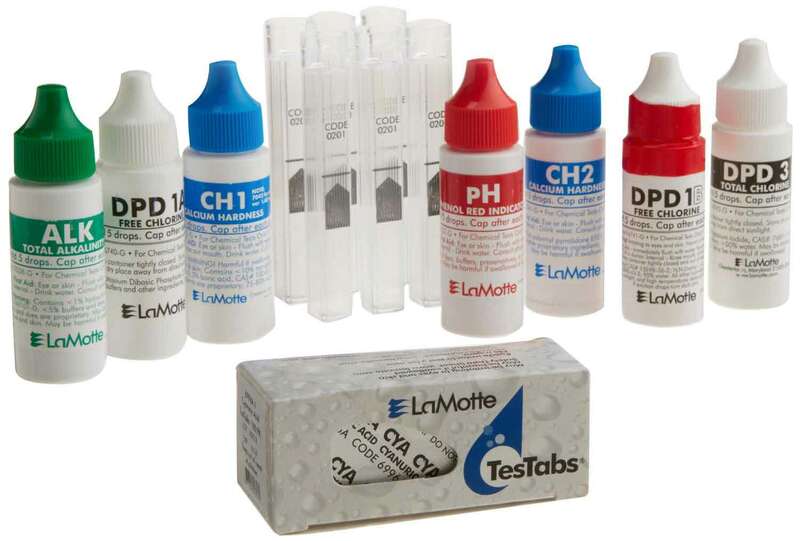 The total alkalinity (TA) should be tested regularly, although in practice it changes very little in a well maintained pool. Calcium hardness measures the amount of dissolved calcium in your pool water, the recommended range is between 80 to 500 parts per million. Calcium hardness can increase through the regular use of pool chemicals (ie granular chlorine contains calcium hypochlorite). When calcium hardness is too low, the water can become corrosive. This can damage your pool surfaces, equipment, pipe fittings and pump connections. Your pool walls and floor can also stain. Calcium chloride is used to increase hardness. If calcium hardness is too high, scaling can form on all of your pool surfaces. The water can become cloudy and swimmers may complain of eye irritations. If the above two options don’t work, add acid to raise saturation levels. This won’t reduce the hardness or your water, but will bring your water back into balance. 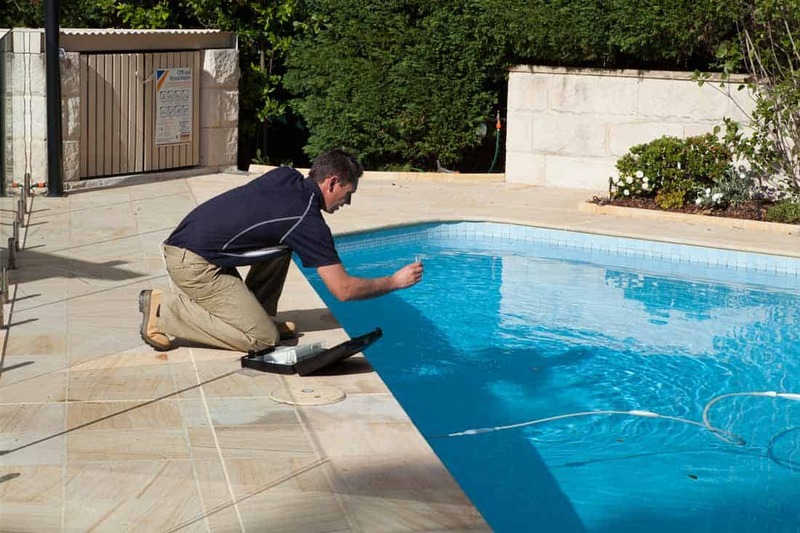 Checking calcium hardness is only required every 12 months or so, unless you are using calcium hypochlorite to sanitise your pool (then monthly or more regular checks may be required). Adding algaecide to your pool will enhance and prolong the effectiveness of the chlorine you’re using for sanitising your pool and be a valuable back-up for helping prevent future algae growth. Normally algaecide is best used as a preventive for algae, although there are some copper-based products that are also effective in killing algae. Using copper-based algaecide does need to be used in moderation, as excessive metals in your pool can cause staining. Algaecide is a good winteriser product to add to your pool, because during this time filtering times are halved and for some people they don’t maintain chlorine as regularly as they should be. Do not swim for 24 hours after adding algaecide to you your pool. Get your water quality checked today!